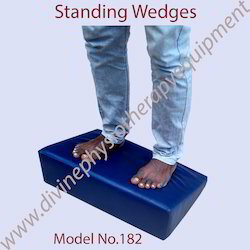 We, at Divine Physiotherapy Equipments, are engaged in manufacturing an ample range of Exercise Therapy equipments. We use sophisticated technology and machinery to manage the timely production and verify the quality of the products, we offer. The products we manufacture are in compliance with international quality standards. Powder Coat Finish. We use Selective Quality Woods & Ply Woods. The corner seat stabilizes the shoulders, pelvis and trunk and facilitates the arms and shoulders to come forward which increases arm movements and allows the child to work on activities in the midline. Adaptive positioning provides stability & support for those lacking full body control. Firm comfortable foam wedges help proper positioning in the Prone & Supine position and for achieving greater gross & fine motor skills. 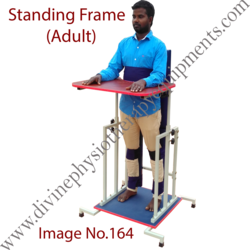 With our professional’s untiring efforts and hard work, we are capable of offering a wide assortment of Cerebral Palsy Chair with Standing Frame. 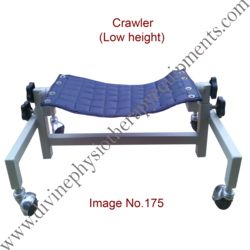 This is used in hospitals and medical center for providing movement to the patients with comfort and ease. Our offered chair is manufactured by utilizing the finest quality materials and contemporary techniques under the observation of our skilled professionals. Available in different sizes and other specifications, this can be purchased from us at marginal price. Neck Support for Neck arrest. G.. Neck Support for Neck arrest. • Non-slip matted foot board. We hold the expertise in manufacturing and exporting Croler, We build our products with first-quality materials imported from the world's best suppliers to fulfill client needs. 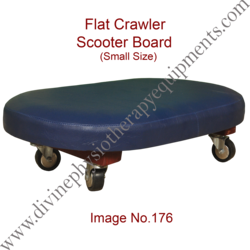 These are featured with adjustable stand, knobs, movable wheels and spongy blue colored holder for easy adjustment. In the field of physiotherapy these are of great usage. Our firm offers these at reliable rate. 3.. Croller bed is Degree adjustable. 4.. 360 degree rotateable Wheel. 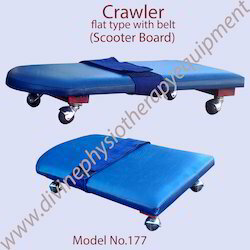 Being a client centric organization, we are affianced in providing the best quality Scooter Board Therapy Equipment. This equipment is specifically manufactured using the best quality wood and Rexene materials by employing contemporary techniques under guidance of our deft professionals. 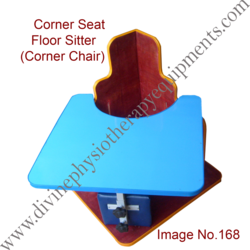 This equipment finds its useful applications in various physiotherapy applications and is made available at reasonable prices. Moreover, this is also checked by our quality professionals on several aspects. Ø We can balance and scoot around by rolling forward, backward and side to side while learning direction and movement our Scooter Boards. 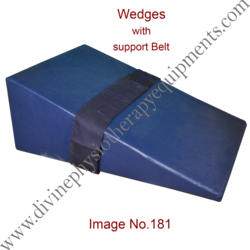 Ø This product is perfect for upper extremity strengthening, prone extension, motor planning and vestibular (movement) activities. 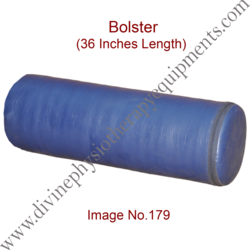 We offer a wide range of Bolster (24inches length & 12inches dia), We manufacture these products using superior quality fabrics. These bolsters are filled with fine quality and soft cotton wrapped with elegantly designed covers. 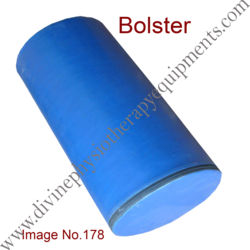 These are widely used for giving treatments in physiotherapy for patients. These bolsters are user friendly and give comfort to the user. We offer these products in a diminutive price range. 3.. 24 inches length & 15 inches dia. We offer a wide range of Bolster (36 inches length & 12inches dia), We manufacture these products using superior quality fabrics. These bolsters are filled with fine quality and soft cotton wrapped with elegantly designed covers. 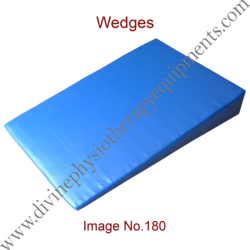 These are widely used for giving treatments in physiotherapy for patients. 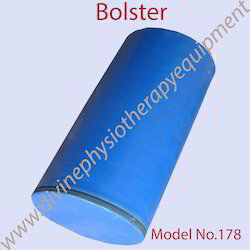 These bolsters are user friendly and give comfort to the user. We offer these products in a diminutive price range. 3.. 36 inches length & 15 inches dia. 3.. 36 inches Length x 24 inches breadth x 15 inches Height. We can balance and scoot around by rolling forward, backward and side to side while learning direction and movement. This product is perfect for upper extremity strengthening, prone extension, motor planning and vestibular (movement) activities. Our organization is counted among the recognized firms engaged in offering a superior quality range of Standing Framesfor our clients. These frames comfortably help in supporting weight and bearings parts of the body. Additionally, these frames help in preventing atrophy of leg muscles, improving range of motion, circulation, lessens muscle spasms & contractions. 6. Non-slip matted foot board. This type of Standing Frame Dismantling type, we are sending the Fitting Photos to your Mail I D.
To meet the enormous requirement of clients, we are providing an excellent range of Cerebral Palsy Standing Frame. This is widely used by the patients who have difficulty in walking due to cerebral palsy. It is manufactured under the vigilance of our seasoned team using excellent grade material. Moreover, our precious clients can avail this in various sizes. This can also be customized as per client’s diverse requirements at affordable prices. We are engaged in manufacturing cerebral palsy (CP) handles, wider supporting legs, soft coated hip supporters and adjustable knobs etc. walkers function as supportive legs for disabled children to improve their walking practice. Our firm sells these at diminutive rate. if you want citing belt is avilable and Charges aplicable. We have been able to carve a niche as a prime organization of an exceptional quality of Cerebral Palsy Chair to our esteemed clients. 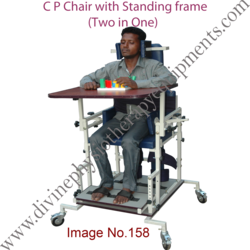 The chair provided by us is used in hospitals, nursing homes and clinics for providing movement to the patients suffering from cerebral palsy. It is well manufactured by utilizing premium quality materials at our well equipped production division. Moreover, this can be purchased from us in different specifications as per customers’ requirements. Looking for Occupational Therapy Equipment-1 ?